Cash: Dan Rizzie is a deeply poetic visual artist. His paintings are full of graceful lines and his own symbology, and his symbols make a lot of sense to me on a visceral and emotional level. I own only one of his paintings—it has a layered black rose at the center, as if it were floating in air—but I wish I had a roomful of his art. It draws me in, and it makes me wake up and become soothed at the same time. He uses black—in roses and tulips and strange teakettles—in a way that makes black seem like the softest color of all. 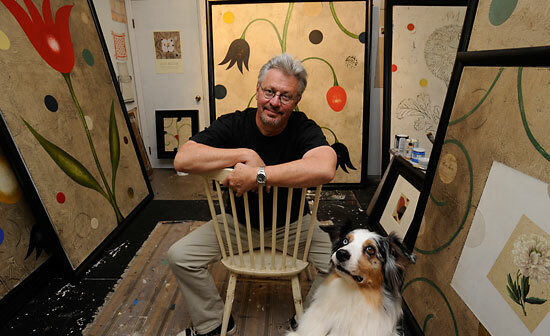 He can paint very densely, as with his Cedar Point, which is a crazy rush of black and red on a huge scale, and he can paint something where the negative space is greater than the content, like his beautiful Poppy (Number One), a pale poppy on a field of scattered polka dots. Dan is my friend. He’s a bon vivant and a tremendously funny guy, which is a great counterpoint to the quiet depth of his art. He lives in Sag Harbor, N.Y., and he looks like he’s the mayor of the whole South Fork, in his boat shoes and summer shirts, hanging onto his dog Vex, commenting on the melodic range of mosquitoes and rescuing random artifacts to hang from trees so he can paint them. I’m just glad there is a painter like Dan Rizzie in the world, to inspire me to look deeper and listen more closely.